Milk and Cookies: Here's The Recipe! 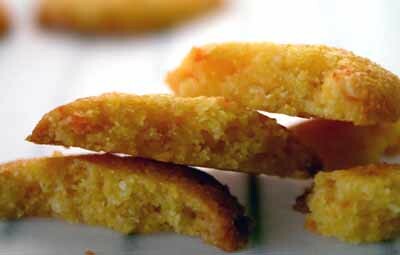 I'm really not one to bow to peer pressure, but in the interest of sharing in all good things, here is the recipe for Orange and Polenta Biscuits. The original recipe states that it yields about 25 biscuits. My batter somehow became very fruitful and multiplied itself, as I got 110 biscuits out of them! I shaped the dough into balls 1.5cm in diameter, so I guess depending on how small or large you portion the dough, you will get approximately 25 to 100 biscuits out of it. Preheat oven to 190C. Combine butter, sugar, polenta and flour in a bowl and rub them together until the mixture becomes crumbly. Mix in the orange zest and two eggs and beat until well incorporated. If necessary, cover the dough in plastic wrap and place in the fridge until slightly firm. Take a portion of dough and roll it into a ball and place on a baking sheet lined with parchment paper. Space the balls approximately 5 cm apart, as the biscuits will spread upon baking. Bake in the oven for 6-10 minutes, or until the outside edges are lightly golden brown. Remove from oven and allow to cool on a wire rack. NOTE: I found that there was no need to refrigerate the dough as I was baking these on a very cold day and the dough was firm enough. This step is optional, depending on the temperature in your kitchen. Thanks! You can bet that I'm going to make these soon! Hi, very interesting! Congratulations for the recipe and for the photoes! I will try these cookies as soon as opssible! thanks for sharing! wow... thats a massive amount of cookies. i'll have to remember this recipe when i bake during the holiday season. thanks for posting the recipe. YUm! Delicious looking! I will have to try these soon!! I love polenta and so glad that Ilva had you up on her site as that's where I came from. I love the photo of the cookies! They sound delicious too! thanks for sharing! YEAH! 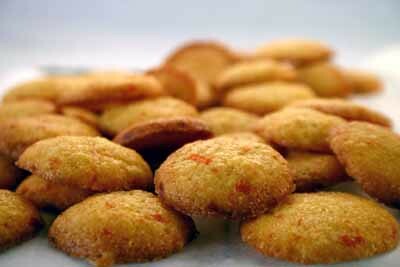 Thank you for posting these...we always need more polenta cookies! I just made these (they are filling up my cookie jar as we speak) and they are *awesome*. I have a question: do you think it matters if you use normal or 'instant' polenta? I used quick cook, cos it's what's in the pantry, and I'm curious if there'd be a difference. Also: I am somewhat convinced that these would work really well as jewels, with little teaspoons of good marmalade in the top. I will experiment and report back. Ali H- definitely let me know how you go with the cookies. The marmalade idea sounds scrumptious! I im not quite sure what kind of polenta i used, but I am sure that it wasn't instant. I will have to investigate further whether or not 'instant polenta' is a viable option.